How much does it cost to travel to Myanmar? How much money will you need in Myanmar? MMK92,746 ($61) is the average daily price for traveling in Myanmar. The average price of food for one day is MMK13,772 ($9.09). The average price of a hotel for a couple is MMK39,899 ($26). Additional pricing is in the table below. These average travel prices have been collected from other travelers to help you plan your own travel budget. Myanmar, or Burma is located in Southeast Asia on the Bay of Bengal and the Andaman Sea. Laos and Thailand lie to the east, Bangladesh and India to the West, and China to the north. Although Myanmar is rich in resources, it suffers from extreme poverty due to widespread corruption and government controls. The country's culture is heavily influenced by both India and China. There are stupas and temples spread throughout the country that are similar to those found in northern India. Theravada Buddhism is the largest religion, similar to that of nearby Thailand. The dominant ethnic group is the Bamar although there are many minority ethnic groups as well, each with their own culture and language. The climate in Myanmar is broken down into three seasons. The hot season runs between March and April and the rainy season is cooler and runs from May to October. November through February is the peak tourism season and also the cool season. Temperatures during the hot season can reach 36 degrees Celsius in Yangon, while the highs during the cool season hang around 32 degrees Celsius. Temperatures are moderately cooler in Mandalay and dramatically cooler in the highlands. Myanmar can be broken down into six regions. These include the lowlands of the Irrawaddy Delta, Central Myanmar, with cool hill towns and many archaeological sites, Western Myanmar with remote mountain regions and beaches along the Bay of Bengal, Northern Myanmar that stretches from the Himalayas southward, Eastern Myanmar with the Golden Triangle, and Southeastern Myanmar that borders Thailand. Because of Myanmar's tense political situation the country's infrastructure is in very poor condition. Much of the western world has trade sanctions against the country, making travel in general difficult. Travel to certain regions is completely prohibited while other areas require a special permit or a mandatory guide. The popular tourist destinations such as Yangon, Mandalay and Bagan are open to foreigners, but once you travel off the beaten path restrictions become a problem. Any visitor may apply for a permit to visit restricted areas, but these permits are rarely issued in a timely manner, if at all. Because the roads and railways are in such poor condition, flying is the most comfortable way to travel around the country. Myanma Airways is the state owned airline. It has a very poor safety record and is best avoided. There are several privately owned airlines that serve the major domestic routes within the country. 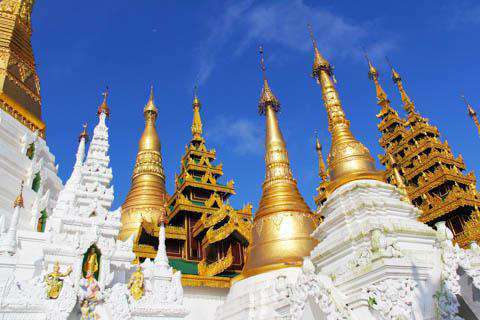 These include Air Bagan, Asian Wings, Air Mandalay, Golden Myanmar Airways and Yangon Airways. These tend to be more expensive but safer than the state run option. The official language of Myanmar is Burmese. There are also many ethnic groups throughout the country who speak their own language. Mandarin is also spoken by the sizeable Chinese community that is most common in Mandalay. Because Myanmar is a former British colony and English is still taught in primary schools, many Burmese understand at least some English. In larger cities you are more likely to find people who know enough English to communicate. Those who work in the tourism industry also typically know some English. Myanmar's currency is the kyat but foreigners are often required to pay for hotels, tourist attractions, train and plane tickets, ferry rides and more with US dollars. Other transactions such as tips and food must be done with kyat. It is technically illegal for Myanmar citizens to take US dollars without a licence but this law is often ignored (but do not insist on paying with US dollars). Officially kyat can not be exchanged abroad so make sure to change it before leaving the country. You may be able to change it in countries with large Burmese populations such as Singapore, but do not plan on this. Popular souvenirs in Myanmar include lacquerware that is made into bowls, cups, vased, and more. You can find this almost anywhere. Myanmar is also known as a miner of jade, rubies and sapphire but be on the lookout for fakes. Tapestries, called kalaga or shwe chi doe are also a popular item to purchase. Bagan: This is the main tourist destination in Myanmar. It was the capital of the first Myanmar Empire and today it is one of the most impressive archaeological sites in all of Southeast Asia. It's located on the eastern bank of the Ayeyawaddy River and is a breathtaking place to visit. Inle: This impressive lake is situated in the middle of Shan State. Located in the mountains, it's amazingly beautiful and cooler in temperature than most places in Myanmar. There are over 30 hill tribes in the surrounding mountains and the culture of the area is fascinating. There are several lake resorts that are built on stilts. Kyaiktiyo: This pagoda sits on a gold gilded boulder at the edge of a hill that stands over 1100 meters above sea level. Burmese food, like the culture, is influenced by Chinese, Indian and Mon flavors. Rice is the staple and there are many vegetarian options available. Regional flavors are obvious as well, with seafood common along the coastline and preserved meats available in the inland areas. Mohinga: This is considered the national dish of Myanmar and is made with rice vermicelli, fish gravy, corriander and chili powder. Flavors can range from sweet to spicy and it is usually served at breakfast. Onnokauswe: This soup dish is made with thick noodles, coconut milk, and chicken. Condiments may include fried fruit fritters or even solidified duck blood. Laphet Thote: This is a Burmese salad that originated in the Shan State and is made with tea leaves and nuts. It often includes sliced lettuce and rice.